1493, July 12. Nuremberg. Anton Koberger. Schedel, Hartmann. 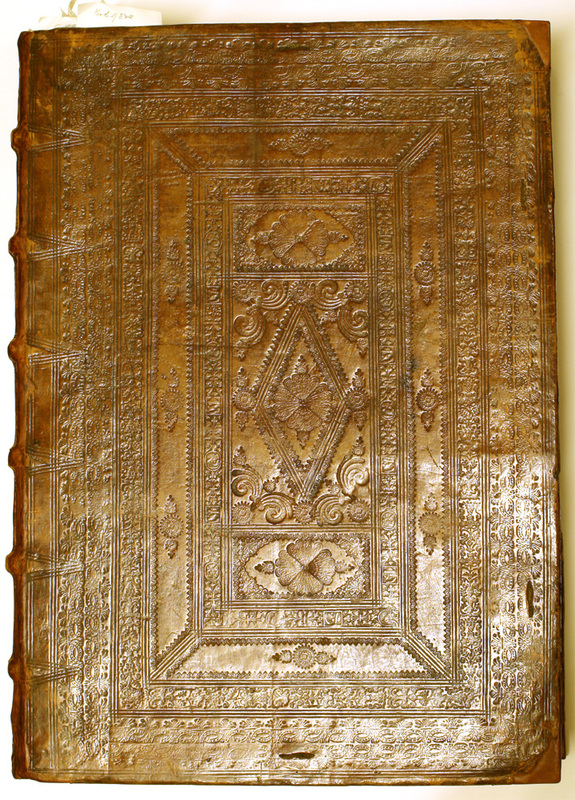 Liber chronicarum. Fol. Some pages in 2 columns. 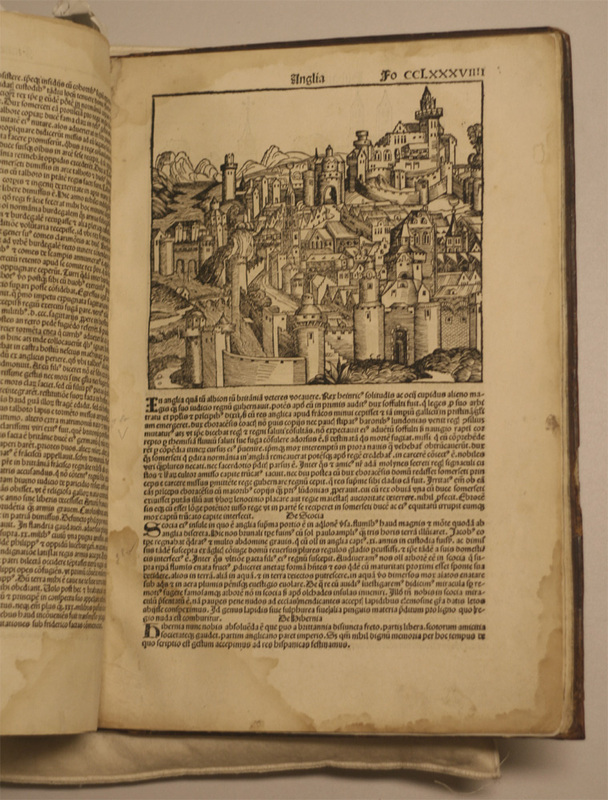 Capital spaces on several pages, but printed capitals for the greater part. 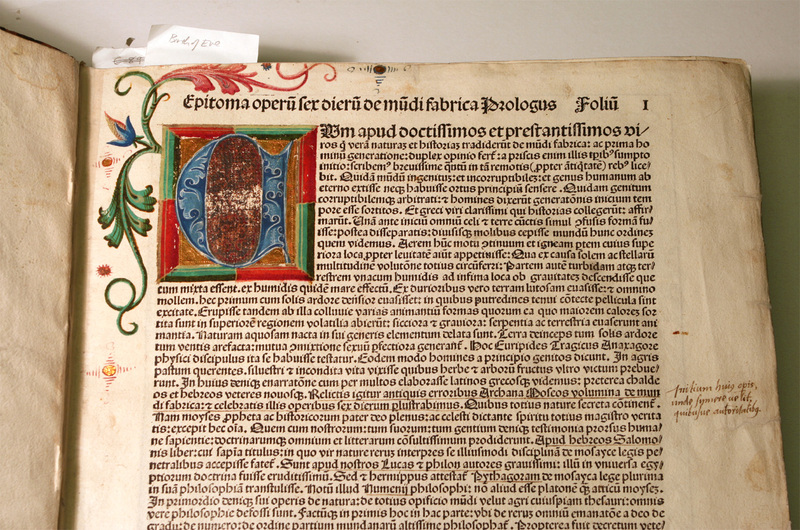 Printed foliation. The woodcuts, by Wohlgemuth and Pleydenwurff, number 1809, of which 1164 are repeats. Proctor 2084, Polain 3469, BMC II, 437. Illuminated capital on leaf I. The type of the headings (0.33 in.) is an Italian rotunda with ornamented capitals, probably the same as that in A12. The text type (0.2 in.) in the same style, though with plain capitals, was cut specially for this book (BMC II, 410). There are Lombardic initials of two sizes, 3-line and 2-line. Woodcut Greek letters on fol. xl verso. The text type has Arabic numerals of an early design (e.g. on fol. iiii recto), though modern by comparison with those of A8-9. This was the most elaborate book produced by Koberger, who had the biggest and best-equipped printing-office of the 15th century. Some copies were sold with hand-colouring on the illustrations. The text type was afterwards used by two other printers at Nuremberg, by Amerbach at Basle, and at Bamberg (BMC II, 410). There is some reason to suspect that the authors had perhaps not visited all the places described in the text. The same woodcut illustrations seem to do service for several different cities, and some of the information is probably a little dubious. The chapters on Scotland and England are shown in the image on the left for you to read if your Latin is good enough. The English translation of the section on Scotland goes as follows: “Scotland is the northern part of the island in which England also is situated, separated from England by small rivers and hills. We were here in winter, when the sun illuminates the land for scarcely more than 3 hours. At that time James was on the throne whom the Lord visited with many sufferings, for, after 11 years imprisonment in England, when he at length returned home with his English wife, he struck down many kinglets with the sword and was eventually himself killed by his own men. His son avenged him and ascended to the throne. We heard that there is a tree in Scotland which grows on river banks and bears fruit in the shape of ducks. As they ripen they fall, of their own will, some on the ground, some in the water; those on the ground rot, but those submerged in the water soon come to life, grow under water and then fly off into the air on feathery wings. When we enquired eagerly about this, we learned that this wonder was more remote and that this famous tree was not to be found in Scotland but in the Orkneys.